Cycling in Berwick is a great way to see the area with cycle routes from Berwick into the Borders and also along the coast to the South. If you are looking for cycle ways in Berwick, the town is central to a number of fantastic circular cycling routes which have been developed around Berwick's food heritage. The trails are free to download at the Mouth of the Tweed website and detail various rides from 8 miles to 44 miles! Cycles are available to hire in Berwick from our cycling experts at Berwick Cycles (Bridge Street) tel: 01289 331476, who can advise on local routes and fit bikes for suitability. The Coast and Castles (Sustrans Route 1) which runs from Newcastle to Edinburgh via Berwick and Melrose, a distance of 200 miles(of which 39 are traffic-free). National Route 76 of the National Cycle Network runs from Berwick upon Tweed to Edinburgh, Stirling and St Andrews with the route on both sides of the Forth. 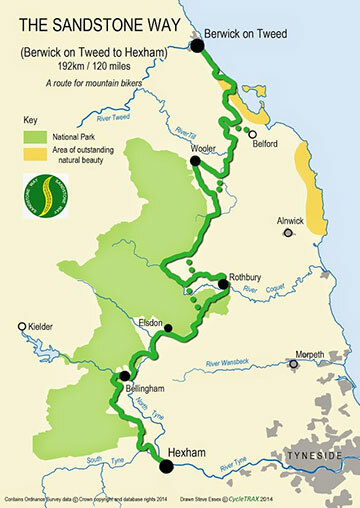 The Pennine Cycleway is the alternative long-distance route. A breath-taking,150 mile cycle, beginning in Appleby-in-Westmorland and finishing in Berwick-upon-Tweed. The Sandstone Way is a 120 mile mountain biking route between Berwick-upon-Tweed and Hexham that runs along the Sandstone Ridge through the heart of North Northumberland. The Cycle PaD (Cycle Portal and Directory) website is a one-stop online knowledge shop bringing together everything cyclists might need to know about Northumberland.